Life cycle: Up to four years are required to complete the life cycle. Winter is spent in the soil or in garden debris. Physical Description: 1/2 to 3 inches long, and brown, gray or blackish. 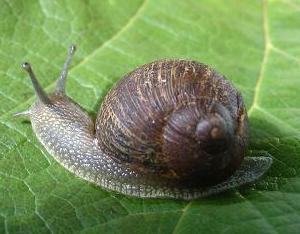 Snails have a soft body with a hump in the center. The eyes are at the ends of small tentacles. Two smaller tentacles are used for smelling. Snails have a single shell and slugs have none. Feeding characteristics: They may graze off young seedlings. 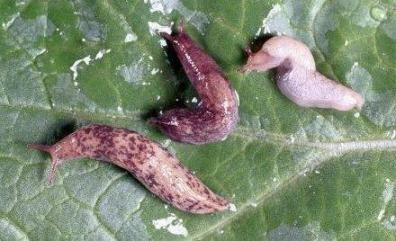 More commonly, they climb larger plants and chew holes in the leaves. Finding Snails and Slugs in the act of feeding (usually at night or after a rain in the warmer regions) is a sure sign that you have identified this causal pest, but more commonly found are tattered leaves and slime trails on the vegetation. Controls: One important point to remember about Snails and Slugs - it takes up to four years for them to complete their life cycle.